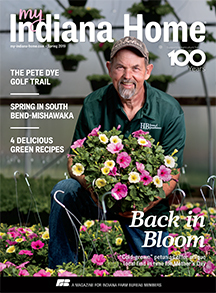 While studying agriculture at Purdue University, Bill Richardson came across an interesting fact about the anonymous creek that coursed through his family’s 600-acre farm in Johnson County. 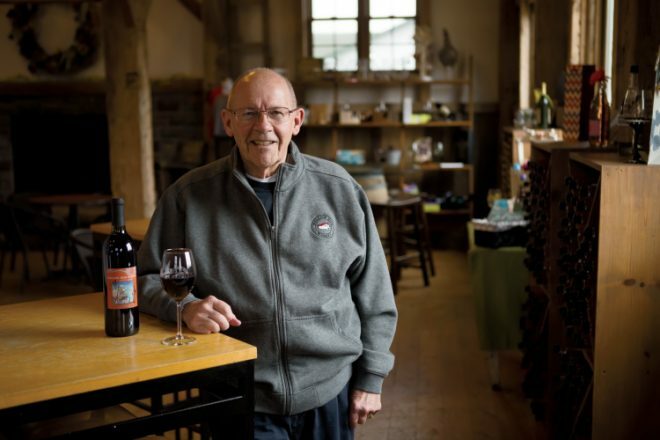 More surprises would follow, as the family farm proved fertile ground for wine making. It all began when his father, John Richardson, retired after a 35-career as an English teacher in New Albany. The senior Richardson returned to the family farm with an eye toward a new retirement hobby. 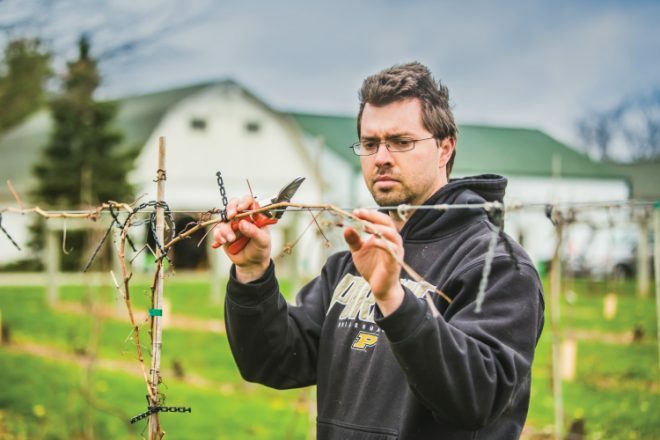 “Dad thought growing grapes would be a fun thing to do in retirement,” recalls his son. Together, they planted the first acre of grapes in 2000, followed by another acre in 2001. 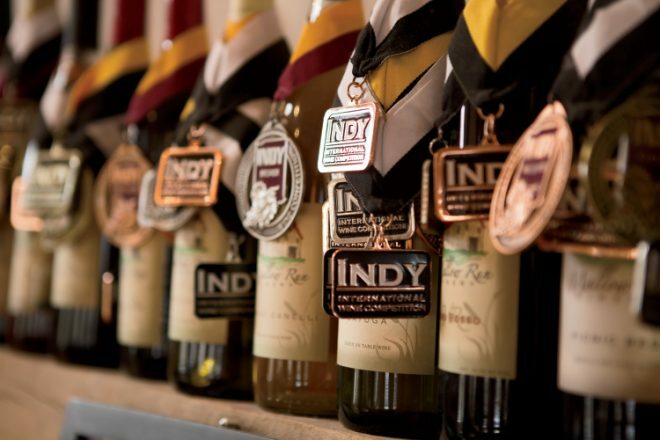 “Our intention was to sell grapes to other wineries,” Richardson says. Hours: Open daily from noon to 6 p.m. Closed on Christmas Day, New Year’s Day, Easter and Thanksgiving. As always, call ahead before traveling long distances. But a bigger dream emerged when the 19th-century barn built by George Mallow cried out for renovations. The Richardsons saw an opportunity to save the barn and build a winery. In 2005, after a year of restoration and renovation, the barn found a new life as a tasting room but maintained its rustic spirit. “Most of the barn is original, with large hand-hewn beams, a 20-foot vaulted ceiling and the old hay hook and track at the peak,” Richardson says. And thus was born Mallow Run Winery. While row crops run in the family’s blood – and are still grown on the land today – grapes presented a learning curve that still continues. “Grapes from the West Coast like Merlot and Chardonnay can’t grow in our much colder winters, so we mostly grow hybrids that have been developed in the last 100 years or so, such as Chardonel and Traminette,” Richardson says. Today, the vintners grow about a dozen varieties of grapes on roughly 12 acres. Beginning in August, harvest brings in 3 to 6 tons per acre, which are processed into each year’s vintage. “Our rhubarb wine outpaces all the others. It’s a sweet wine, but the rhubarb brings an acidic zing to it,” Richardson says. Mallow Run’s next top seller is the Concord wine, which hints of grape jelly. 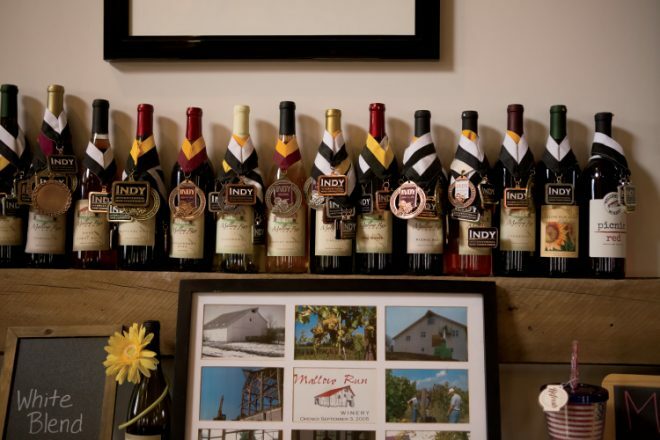 To complement their wines, Mallow Run offers cheeses, meats, and fruit-and-cheese plates. You can even purchase homegrown, premium Angus beef at the winery. If you have a taste for entertainment, Mallow Run can satisfy that, too. Those big ideas include outdoor concerts every Saturday from Memorial Day through September. The popular events draw as many as 1,500 people to the farm. During the winter months, the winery offers a warm welcome and hot soup. Beyond lovers of wine and music, the venue has proven irresistible to those in love. The Richardsons recently opened an elegant banquet space to meet the growing number of requests for weddings. They also host outdoor weddings in the vineyard. Thanks to a retirement hobby run amok, people from near and far can savor the fruits of the land long loved by the Richardson family.